Did you know that you can upload your own audio file? Well, that means you can upload your own audio file to make your Voki sing! It’s a great way to get people to sing along to your songs! But remember, there is a 1-minute recording time for the basic Voki editor. 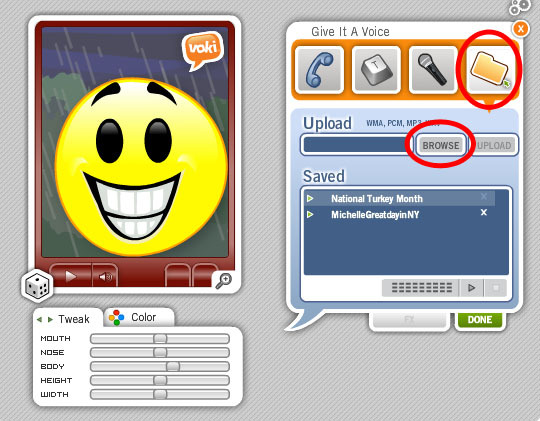 Students can record up to 90 seconds in Voki Classroom. Follow these easy steps to get your singing Voki! 1. Go to www.Voki.com and create your Voki. 2. Click on the Folder button and Browse for your audio file. 3. Click Upload after you found your audio file. 4. Click the Publish button. Now your Voki can sing!